Join Fellow Educators at the 2011 Advanced Shared Inquiry Institute! Be sure to visit our website or call 800-222-5870 for full details!Great Books Chicago is produced with the generous support of Harrison Middleton University, Penguin Books, and Encyclopædia Britannica. 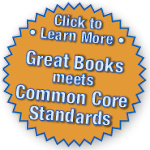 Shared Inquiry™ is a trademark of the Great Books Foundation.